Komodo National Park is a national park located within the Lesser Sunda Islands in the border region between the provinces of West Nusa Tenggara and East Nusa Tenggara , Indonesia. The park includes the three larger islands Komodo, Rinca and Padar , and 26 smaller ones, with a total area of 1,733 km2 (603 km2 of it land). 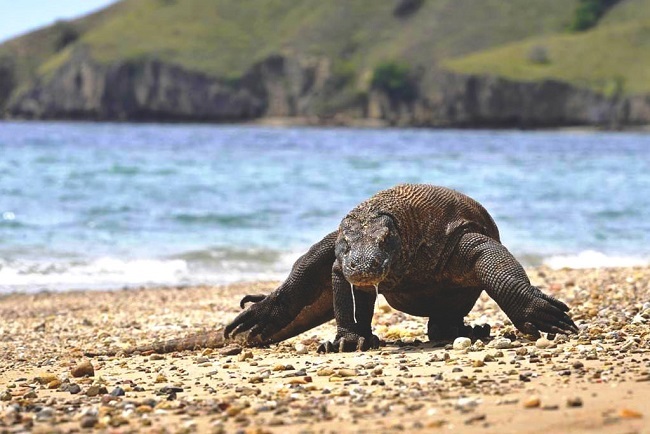 The national park was founded in 1980 to protect the world’s largest lizard – Komodo dragon, the world’s largest lizard. Later it was dedicated to protecting other species, including marine species. The national park was declared a UNESCO World Heritage Site in 1991 . Komodo island contains rich marine biodiversity. Komodo islands is also a part of the Coral Triangle, which contains some of the richest marine biodiversity on Earth. In 1980 Komodo National Park was established , with the main purpose of the Park was to conserve the unique Komodo dragon and its habitat. However, over the years, the goals for the Park have expanded to protecting its entire biodiversity, both terrestrial and marine. In 1986, the Park was declared a Man and Biosphere Reserve and a World Heritage Site by UNESCO, both indications of the Park’s biological importance. The gateway cities of Labuan Bajo and Bima are connected to Denpasar, Bali by overland buses. The gateway cities of Labuan Bajo and Bima are also connected to Denpasar, Bali by inter-island ferry. Fortnightly (every two weeks) on Saturdays: 09.00-20.00 (next day). Fortnightly (every two weeks) on Thursdays: 08.00-11.00 (next day). Komodo National Park is serviced by a wide range of live-aboard boats, with return packages to Komodo National Park from a variety of departure points, including Bali, Lombok, Bima and Labuan Bajo . Prices (as of 10/6/06) are ranging from $230 – $295 / person / night. Scuba diving is popular because of the park’s high marine biodiversity. The development of, largely marine-based, ecotourism is the main strategy to make the park self-financing and generate sufficient revenue through entrance fees and tourism licenses to cover operational and managerial costs. To this end, a joint venture between TNC and a tourism operator were granted a tourism concession, that also entails extensive park management rights. This concession has generated an ongoing controversy. The joint venture has been accused of making decisions behind closed doors, and many people in and around Komodo claim that they haven’t been consulted regarding decisions that ultimately affect their lives. Komodo Island and Rinca were once part of Flores and they are separated from the large Island of Sumbawa to the West by the Sape Strait. The ocean in the Strait drops hundreds of meters. The Pacific Ocean to the north and the Indian ocean to the south are actually at different heights – so the flow of currents from the Pacific to the Indian during tidal exchanges makes the currents among the strongest in the world. In the (relatively) shallow waters along the east coast of Komodo towards Labaun Bajo, these currents can be extremely dangerous with inexperienced guides. The number of visitors to the park increased from 36,000 in 2009 to 45,000 in 2010. Most of the visitors were foreign tourists as the high transport cost to this remote location is less affordable for local visitors. A year the park can accommodate up to 60,000 visitors according to the local tourism agency. Several types of boat tours run through the national park including upscale scuba liveaboards, short daily snorkel trips and 4 day, 3 night ‘tourist boats’ between Lombok and Flores. Have uncertain safety records althoght the tourist boats run very frequently . In an August 2014 incident one of these tourist boats sank, and 2 tourists were lost. Strong waves and currents separated the stranded crew and passengers who were floating at sea in lifevests. The terrain is generally rugged, characterized by rounded hills, with altitudes up to 735 m. The climate is one of the driest of Indonesia with annual rainfall between 800mm and 1000mm. Mean daily temperatures in the dry season from May to October are around 40 °C.